BA, BA (hons. ), UHDE, University of Durban Westville; MA and PhD (1996), Indiana University, Bloomington. My Ph.D dissertation focused the making of Indian identities in South Africa, 1914-1949. 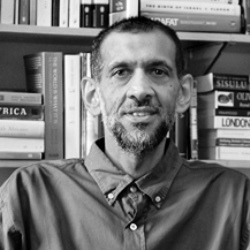 Subsequent research, broadly, has focused on the colonial encounter between Indians, Africans and whites in KwaZulu Natal; the transformations of Indian identities in South Africa; Islam and Muslims (particularly KwaZulu Natal), and the role of sport and culture (particularly cricket) in South African society. Chota Motala. A Biography of Political Activism in the KwaZulu-Natal Midlands. Pietermaritzburg: University of KwaZulu-Natal Press, 2018. (ISBN 9781869143824). The South African Gandhi. Stretcher-Bearer of Empire. Stanford University Press (ISBN: 9780804797177 / ISBN-10: 080479717X) and New Delhi: Navayan Publishing (ISBN 9788189059743), 2016. Indentured Muslims in the Diaspora. Identity and Belonging of Minority Groups in Plural Societies. New Delhi: Manohar (ISBN 9789350981313), 2016. Edited with Mauits S. Hassankhan and Lomarsh Roopnaraine. Dirty Linen. The ‘other’ Durban 1870s-1980s. Durban: DUT, 2014. With Len Rosenberg. The Making of Place. The Warwick Junction Precinct: 1870s-1980s. Durban: DUT, 2013. Co-Authored. [ISBN 978-1-919858-24-1]. With Len Rosenberg and Sam Moodley. Curries Fountain. Sport, Politics, Identity. Durban: DUT, 2013. [ISBN 978-1-919858-23-4]. With Len Rosenberg and Sam Moodley. Chatsworth. The Making of a South African township. Edited with Ashwin Desai. UKZN Press, 2013. [ISBN: 978-1-86914-255-1]. Many Lives. 150 Years of Being Indian in South Africa. Pietermaritzburg: Shuter and Shooter, 2010 [with Thembisa Waetjen and Ashwin Desai]. Gender, Modernity, and Indian Delights. The Women’s Cultural Group of Durban, 1954-2010. Cape Town: HSRC Press, 2010 [with Thembisa Waetjen]. Monty Naicker. Between Reason and Treason. Pietermaritzburg: Shuter and Shooter, 2010 [with Ashwin Desai]. Inside Indian Indenture. A South African Story, 1860-1914. Cape Town: HSRC Press, 2010 [with Ashwin Desai]. Dear Ahmedbhai, Dear Zuleikhabhen. The Letters of Ahmed Kathrada and Zuleikha Mayat 1979-1989. Johannesburg: Jacana, 2009 [with Thembisa Waetjen]. Empire & Cricket. The South African Experience 1884-1914. Pretoria: UNISA Press, 2009 [co-edited with Bruce Murray]. The Making of a Social Reformer. Mahatma Gandhi in South Africa, 1893-1914. Delhi: Manohar Books, June 2005 [with Surendra Bhana]. Blacks in Whites: A Century of Sporting Struggles in Kwazulu Natal, 1880-2002. Pietermaritzburg: University of Natal Press, 2002 [with Vishnu Padayachee, Krish Reddy and Ashwin Desai]. ‘Brij V. Lal: Rooting for History,’ in Doug Munro and Jack Corbett. Eds. Bearing Witness. Essays in Honour of Brij V. Lal. Canberra: Australian National University, 2017: 65-86. ‘Islam and Muslims in South Asia in the Nineteenth and Twentieth Centuries: Revolt, Revivalism and Accommodation,’ In Maurits S. Hassankhan, Goolam Vahed and Lomarsh Roopnaraine (Eds). Indentured Muslims in the Diaspora. Identity and Belonging of Minority Groups in Plural Societies. New Delhi: Manohar (ISBN 9789350981313), 2016, pp. 19-58. ‘Indian Muslims in South Africa: Historical and Contemporary Perspectives, 1860-2016’,’ In Maurits S. Hassankhan, Goolam Vahed and Lomarsh Roopnaraine (Eds). Indentured Muslims in the Diaspora. Identity and Belonging of Minority Groups in Plural Societies. New Delhi: Manohar (ISBN 9789350981313), 2016, pp. 81-106. Muharram in Diasporic Settings in the Twenty-First Century,’ In Maurits S. Hassankhan, Goolam Vahed and Lomarsh Roopnaraine (Eds). Indentured Muslims in the Diaspora. Identity and Belonging of Minority Groups in Plural Societies. New Delhi: Manohar (ISBN 9789350981313), 2016, pp. 301-324. ‘Indian Muslims and Mosque Construction in Australia,’ In P. Kumar (Ed). Indian Diaspora. Social Cultural and Religious Worlds. Leiden: Brill, 2014. pp. 316-344..
‘Power and Resistance: Indentured Labour in Colonial Natal 1860-1911,’ In Maurits S. Hassankhan, Brij V. Lal, and Doug Munro (Eds). Resistance and Indian Indenture Experience. Comparative Perspectives. New Delhi: Manohar, 2014: pp. 95-120. ‘Writing Chatsworth: An Introduction’ (pp. 1-18; with Ashwin Desai); ‘Segregation, Group Areas and the Creation of Chatsworth’ (pp. 19-30); ‘Zanzibaris’ (pp. 84-98); ‘Schooling in Chatsworth: The Persistence of Inequalities in Post-apartheid South African Education’ (pp. 243-256; with Mark Hunter); ‘Our Indian Polices are Bought Off’: Chatsworth’s Men in Blue Speak Back’ (pp. 319-331); ‘Between the Heavens Above and Havens Below: The Growing Power of Pentecostalism’ (pp. 415-432);‘ In Ashwin Desai and Goolam Vahed Eds. Chatsworth. The Making of a South African Township. Scottsville: University of KwaZulu Natal Press, 2013. Identity and Belonging in Post-Apartheid South Africa: The case of Indian South Africans,’ In Sujata Patel and Tina Uys. Eds. Exclusion, Social Capital and Citizenship. Contested Transitions in South Africa and India,’ New Delhi: Routledge, 2012: 488-508. [with Ashwin Desai]. ‘Monty… Meets Gandhi … Meets Mandela: The Dilemma of Non-violent resisters in South Africa, 1940-60,’ In Isabel Hofmeyr and Michelle Williams. Eds. South Africa & India. Shaping the Global South. Johannesburg: Wits University Press, 2011: 105-125. An ‘Imagined Community’ in Diaspora: Gujarati’s in South Africa.” In Nalin Mehta and Mona G. Mehta. Eds. Gujarat Beyond Gandhi. Identity, conflict and Society. New Delhi: Routledge, 2010: 210-231. ‘World Cup 2010: Africa’s Turn or the turn on Africa?’. In Peter Alegi and Chris Bolsmann. Eds. South Africa and the Global Game. Football, Apartheid and Beyond. London: Routledge, 2010: 154-167. [with Ashwin Desai]. ‘Beyond the nation? Colour and class in South African cricket,’ in Ashwin Desai. Ed. The Race to Transform. Sport in post-apartheid South Africa. Cape Town: HSRC Press, 2010: 176-221. [with Ashwin Desai]. ‘Indian Muslims in South Africa’s History: Continuity and Change,’ in Ali A. Mazrui et. al. Eds. Africa’s Islamic Experience. History, Culture, and Politics. New Delhi: Sterling Publishers Private Limited, 2009: 73-108. ‘Contesting Indian Islam in KwaZulu-Natal: The Muharram Festival in Durban, 2002,’ in Preben Kaarsholm and Isabel Hofmeyr. Eds. The Popular and the Public: Cultural Debates and Struggles over Public Space in Modern India, Africa and Europe. London: Seagull Books, 2009: 107-140. ‘Indentured Masculinity in Colonial Natal, 1860-1910,’ in Robert Morrell and Lahocine Ouzgane. Eds. Anthology on African Masculinities. Pelgrave: 2005: 239-256. ‘Multiple Communities: Muslims in Post-apartheid South Africa,’ in John Daniel, Roger Southall, and Jessica Lutchman. Eds. The State of the Nation: South Africa 2003-2004. Cape Town: HSRC Press, 2004: 252-286. [with Shamil Jeppe]. ‘Deconstructing “Indianness”: Cricket and the Articulation of Indian Identities in Durban, c.1900-32,’ in J.A. Mangan and Andrew Ritchie. Eds. Ethnicity, Sport, Identity: Struggles for Status (Sport in the Global Society Series). London: Frank Cass, 2004: 144-168. ‘The Protector, Plantocracy, and Indentured Labour in Natal,’ Pacific Historical Review. An International Journal Published by the University Of California Press, 87.1 (2018): 101-127. Special Issue: Protection: Global Genealogies, Local Practices. Christina Twomey and Katherine Ellinghaus, Guest Editors. ‘The Guptas, the Public Protector’s Report and Capital Accumulation in South Africa,’ Alternation, 24.1 (2017): 26-49. ‘New histories of education in South Africa: authors’ reflections on Schooling Muslims in Natal,’ Transformation, 94 (2017): 66-70. With Thembisa Waetjen. ‘The Past in the Present: Writing the South African Gandhi,’ Journal of Labor and Society, 20.1 (2017): 107-127. ‘Diaspora, Citizenship and Identity: Migration from Kathor (Gujarat, India) to Durban (Natal, South Africa)’, Indian Anthropologist, 47.1 (2017): 35-50. ‘Indentured Labour Migration and the Making of an Indian Diaspora in South Africa, 1860-1911,’ Fijian Studies, 15.1 (2017): 27-46. ‘The Coming of Nelson and the ending of Apartheid cricket. Gatting’s Rebels in South Africa,’ The International Journal of the History of Sport, 33.15 (2016): 1785-1803. With Ashwin Desai. ‘Family, Gender, and Mobility among Passenger Migrants into Colonial Natal: The Story of Moosa Hajee Cassim (c.1840s–1921),’ Journal of Southern African Studies, 42.3 (2016): 505-522. Nehru is “just another coolie”: India and South Africa at the United Nations, 1946-1955,’ Alternation, 15 (2015): 54-85. ‘Migrants, Drugs and Xenophobia: The Case of Whoonga Park in Durban.’ Oriental Anthropologist, 2015: 15. 2 (2015): 1-22. ‘Gandhi, Indian Opinion, and the making of Indo – South African identity, 1903 – 14,’ Comparative Studies of South Asia, Africa and the Middle East, 35:2 (2015): 354-360. ‘Shifting Grounds: A.I. Kajee and the Political Quandary of ‘Moderates’ in the Search for an Islamic School Site in Durban, 1943–1948,’ South African Historical Journal, 67.3 (2015): 316-334. [with Thembisa Waetjen]. ‘Women and national liberation in South Africa: an oral history perspective,’ South Asian Diaspora, 7.2 (2015): 129-147. ‘Muslim women’s identities in South Africa: A Zanzibari perspective in KwaZulu-Natal,’ New Contree, No. 70, Special Edition, December 2014: 107-130. ‘Passages of Ink: Decoding the Natal Indentured Records into the Digital Age,’ Kronos, 40, 3 (2014): 45-73. with Thembisa Waetjen. After Mandela Met Gandhi: The Past and Future of India-South Africa Relations,’ Journal of Sociology and Social Anthropology, Special Issue No. 4 (2014): 9-18. ‘Empire’s soldier: Gandhi and Britain’s wars, 1899-1918,’ Journal for Contemporary History, 39, (2014): 1-14. The formal education journey of Cassim Dangor, 1963–1985: Reflections on education challenges in apartheid South Africa,’ Historia 59, 1 (2014): 38-58. Development Impact of Mosque Location on Land Use in Australia: A Case Study of Masjid al Farooq in Brisbane,’ Journal of Muslim Minorities Affairs, 34.1 (2014): 1-16. [With Yasmeen Vahed]. Cricket and corruption: the post-apartheid relationship between India and South Africa within and beyond the boundary,’ Diaspora Studies, 6:2 (2013): 80-91. School sports. The Missing Dimension in the Debate about Sports Transformation in Democratic South Africa since 1994,’ Journal of Sociology and Social Anthropology, Special Issue No. 3 (2013): 49-59. In the end it was academic: Responses to the establishment of the University College for Indians,’ Journal of Natal and Zulu History, 31.1 (2013): 22-44. Indian Muslim Responses To Islamophobia In Australian Cities: Conflicts over Mosques,’ Man In India, 93.4 (2013): 689-711. Non-Governmental Organisations and Xenophobia in South Africa: A Case study of the Gift of the Givers (GOTG),’ Alternation, Special Edition, 20.7 (2013): 241-266. (with Ashwin Desai). The May 2008 Xenophobic Violence in South Africa: Antecedents and Aftermath,’ Alternation Special Edition, 20.7 (2013): 145-175. (with Ashwin Desai). Institutional Hinduism: The Founding of the South African Hindu Maha Sabha, 1912,’ Journal of Sociology and Social Anthropology. 4. 1-2 (2013): 17-29. Special Issue on Hinduism in South Africa. Hinduism in South Africa: Caste, Ethnicity, and Invented Traditions, 1860-present,’ Journal of Sociology and Social Anthropology. 4.1-2 (2013): 1-15. (with Vinay Lal). ‘Race, Empire, and Citizenship: Sarojini Naidu’s 1924 Visit to South Africa,’ South African Historical Journal,’ 64.2 (2012): 319-342. ‘Power and Resistance: Indentured Labour In Colonial Natal, 1860-1911’ Man In India, 92.2 (2012): 299-317. ‘Urban Violence and the textures of everyday life in post-apartheid South Africa.’ Oriental Anthropologist. 12.2 (2012): 299-317. ‘The Diaspora at home: Indian Views and the making of Zuleikha Mayat’s public voice,’ Africa, 81.1. 2011: 23-41. [with Thembisa Waetjen]. ‘Ahmed Deedat and Muslim-Christian Relations at the Cape, c. 1960-1980.’ Journal for Islamic Studies. 29 (2009): 2-32. “The Viability of Islamic Banking and Finance in a Capitalist Economy: A South African Case Study,” Journal of Muslim Minority Affairs. 28.3 (2008): 453-472. ‘Islam in the Public Sphere in Post-apartheid South Africa: Prospects and Challenges,’ Journal for Islamic Studies, 27 (2007): 116-149. ‘Unhappily torn by dissensions and litigations’: Durban’s `Memon’ Mosque, 1880-1930’. Journal of Religion in Africa. 36.1, 2006: 23-49. “Passengers, Partnerships, and Promissory Notes: Gujarati Traders in Colonial Natal, 1870-1920”. International Journal of African Historical Studies. 38.3. 2005: 449-479. The Quest for ‘Malay’ identity in Apartheid South Africa”. Alternation. International Journal for the study of the Arts and Humanities in Southern Africa. Volume 11, No. 1, 2004: 256-282. Published in 2005. “Contested Meanings and Authenticity: Indian Islam and Muharram Performances in Durban, 2002”. Journal of Ritual Studies. 19.2. 2005: 129-145. “Muslim marriages in South Africa: the Limitations and Legacy of the Indian Relief Act of 1914”, in Journal of Natal and Zulu History, vol. 21: 2003: 1-40. “Managing South African Transformation: The Story of Cricket in KwaZulu Natal, 1994-2004”. In Patterns of Prejudice vol. 38, no. 3 (September 2004: 253-278. [with Vishnu Padayachee]. “Taking up the White Man’s Game: The Rise and Decline of African Cricket in Durban, 1930-1960”. Historia. 48.2 (November 2003): 111-126. “A Sufi Saint’s Day in South Africa: The Legend of Badshah Pir”. Islamic Culture. LXXVII.4 (October 2003): 31-70. “Contesting “Orthodoxy”: The Tablighi-Sunni Conflict among South African Muslims in the 1970s and 1980s”. Journal of Muslim Minority Affairs. 23.2 (October 2003): 315-336. “Cultural Confrontation: Race, Politics and Cricket in South Africa in the 1970s and 1980s.” Culture, Sport, Society. 5.2 (Summer 2002): 79-107. “Constructions of Community and Identity among Indians in Colonial Natal, 1860-1910: The Role of the Muharram Festival”. Journal of African History. 43.1 (2002): 77-93. “‘Give Till It Hurts’: Durban’s Indians and the First World War”. Journal of Natal and Zulu History. 19 (1999-2001): 41-61. “Uprooting, Rerooting: Culture, Religion and Community Amongst Indentured Muslim Migrants in Colonial Natal, 1860-1911”. South African Historical Journal. 5 (November 2001): 191-222. “There is plenty of play left in South Africa’s Race Game”: Hansiegate, Race, Cricket and Nation in Post- Apartheid South Africa, Societies in Transition. 32.2 (2001): 227-246. “Mosques, Mawlana’s and Muharram: Establishing Indian Islam in Colonial Natal, 1860-1910”. Journal of Religion in Africa. XXXI (2001): 3-29. “What Do They Know of Cricket Who only Cricket Know?” Race, Class and Transformation in Post-Apartheid South Africa, International Review for the Sociology of Sport. Vol. 36, no. 3 (2001): 319-336. “Race, Class, Community and Conflict: Durban’s Indian Municipal Employees Union, 1914-1949″. Journal of Southern African Studies. vol. 27, no. 1 (March 2001): 104-125. “Control and Repression: The Plight of Indian Hawkers and Flower Sellers in Durban, 1910-1948”, International Journal of African Historical Studies. vol. 32, no. 1 (December, 1999): 19-48. “Natal’s Indians, the Empire and the South African War, 1899-1902”, New Contree. vol. 45 (September 1999): 185-216. “’A Public Nuisance’: The Victoria Street Squatters’ Market in Durban, 1910-1934”. South African Historical Journal, vol. 40 (May 1999): 130-153. “The Control of African Leisure Time in Durban during the 1930s”, Journal of Natal and Zulu History, vol. 18 (1998): 67-123. “The Making of Indianness: Indian Politics in South Africa during the 1930s and 1940s”, Journal of Natal and Zulu History, vol. 17 (1997): 1-37. The book Chatsworth. The Making of a South African township received the UKZN Edited Book Prize for 2014. Top 30 Researcher, UKZN: 2012, 2014, 2015. Member, Governing Board. Documentation Centre, UKZN (Westville Campus). Editorial Board, Journal of Sociology and Social Anthropology [2010-]. Visiting Fellow, Key Centre for Ethics, Law, Justice and Governance, Griffith University, Brisbane, Australia. October / November 2006. Sephis. International Institute of Social History, Amsterdam. Research Grant. Project Title: Indians in South Africa, 2001/2002. Ernest Oppenheimer Fellow, Centre of African Studies, School of Oriental and African Studies (SOAS), University of London, 2000. Social Science Research Council (USA) Dissertation Fellowship for PhD research 1988 / 1989. Fulbright Scholarship to study History at Indiana University, Bloomington, USA, 1985-1987. This part of the course examines the broad internal and external developments that have shaped the history of the USA from World War II to the 1970s, as well as the influence of the USA on the outside world. After 1945, the US chose to play a major role on the international scene, throughout the Cold War and beyond. During this period, the country was rapidly and profoundly transformed from a rural and agriculturally defined society into a modern, urbanized community, easily the world’s largest military-industrial-scientific complex. This has not been without consequences. Externally, the country experienced armed conflict in Korea, Vietnam, and the Middle East, the long Cold War and, most recently, the “War on Terror”. Internally, this transformation has been accompanied by interethnic and interracial strife, class conflict, and social unrest as larger numbers of Americans challenged the elites who dominated the nation’s life. The Civil Rights Movement, followed by the voices of feminists, gays, students, and lesbians, and new immigrants, forced a reexamination of old standards of exclusion, and ushered in a more diverse and contested image of the nation. The idea of empire is at the heart of our debates about the modern world. The tensions that past and current empires have created shape our everyday lives. Over the last 1 000 years, empires have established the foundations of political and economic life for almost all the inhabitants of our world. This course will introduce you to some of the key features imperial systems over the last 250 years, ranging from eastern to western empires, and including the Spanish Empire and the Ottoman Empire, the British Empire in India and European empires in Africa. We will explore debates about neocolonialism and the United States of America, once itself a British colony and now regarded by some as a modern empire. We will also look at the forms that opposition to imperialism has taken, and at the forces that have led to the collapse of empires. Whereas in the first semester, the focus was on developing skills in accuracy of historical information through quizzes and short questions in tests and the exams, our focus shifts in this semester to essay writing skills, and to developing your ability to use information in historical analysis and debates. Law, Crime and Society in History examines the changing social contexts in which ideas about law, crime, property, freedom, power and rights have been codified and challenged in different regions of the world. It offers a conceptual framework and historical background for understanding some of the crucial legal, political and ethical debates of our own times, as well as of the power and limitations of the law in addressing them. Specific historical examples that highlight the conflict-laden interplay between legal formations of political power and social relations around land, wealth, labour, culture, gender and violence are discussed. This course examines the use of ‘race’ to create highly differentiated notions of ‘them’ and ‘us’ by cultures and (since the eighteenth century) the nation-state to draw lines of exclusion and inclusion. Contemporary discussions about race are situated into a historical context. Key writings on race and racism in diverse settings are examined against the backdrop of larger concerns. Why were certain ideologies and practices introduced, and who profited from their perpetuation? Can we meaningfully speak of a general theory of race and racism? How should we make such comparisons? What are the limits and limitations of this approach? What considerations should be taken into account in such comparative history? Siyabonga Nxumalo. PhD. ‘Untold stories of the Marginalized: A Social History of Farm Workers in KwaZulu-Natal, 1960s-2000s’.